I can't wait for the details on Griffiths attack on magical forests, does this mean that the siege of Flora's mansion wasn't just an isolated attack against one witch, but part of a larger campaign to destroy other Magus colonies? Does this mean Griffith commands other apostles across the world and not just his war demon army? Good episode. Looking forward to the next one! Thanks for the summary Aaz. There is so much to digest in this episode, and indeed, Griffith's attack on the Spiritual Trees is incredibly intriguing. I'm glad we won't have to wait very long for an explanation! Thank you guys as always. Time to enjoy monthly episodes is back! Thanks for the summary Puella and Aaz! As I'd hoped, the amount of text in this episode indicated a big reveal! One of the things that I enjoy about Berserk nowadays is how we're not only seeing events unfold as members here have been predicting for years, but we get these pretty monumental surprises that help shape our understanding of the entire series. I spent much of this episode reflecting on the group's time with Flora and how much she can inform us retroactively about what's coming. I'm gonna be looking through my volume 24 tonight for clues! A big concern I've had for the last few months is the time skip part of Elfhem. We will know after the japanese translation but I don´t know how to interpretate the pun about Puck missing. Was it because he is one you don't care about in the island or because it was a really short time? He then exchanges a silent stare with Guts, because that's what cool guys do when they meet. Thanks a lot for the summary ! There hasn't been such an information treasure trove in years. Mouth was agape throughout this episode, and that was before the summary Puella provided. The old men trees reminded me of one of Flora's last lines to Schierke -- for great magic users, death isnt the end, but the beginning of a new kind of existence. I wonder if those entities inhabiting the trees were once old magic users who had their souls transferred to trees to prolong their "lives." Which of course, made me think of our favorite old man knight. I'm in disbelief of the pace being set in recent episodes. We've already been delivered specifics of how Casca's mind could be restored, and are literally on the doorstep of the Elf King, events more than 14 years in the making. Fantastic that Puck got such recognition for his involvement in the scope of things. Also, Morda is looking even more like Krysten Ritter in this ep than the last. I'm convinced. Thank you for that great summary, puella and Aazealh! Very informative and cleared some things up for me that I had misinterpreted. Wow. I'm still trying to process all this new and incredible information, but I wanted to sincerely thank Puella and Aaz for the summary. You two are absolutely amazing. It's funny seeing the curing of Casca described as a small gift considering how much importance it has to Guts and us, the readers. A subtle testament to just how incredibly powerful the king is perhaps. I too am curious about hearing more about what Griffith has truly done, and the end result of it, from these magic users (and elves) as well as what they're calling the changing of the world. Also, Skellig is everything I could have ever dreamed of and then some. After all this time Miura still continues to impress me. What an insanely talented author. We get to read the work of the greatest manga author on earth, translated by the greatest translator on earth, and discuss it on one of the few truly great forums on the internet. How incredibly lucky are we? How incredibly lucky are we? A lot! Which I take this opportunity to say thx for the summary Aaz and Puella. Thank you so much to Aaz and Puella for the summary! Yup. I was thinking the character of Jane, in particular. For those wondering what I'm talking about, she was a Breaking Bad girl who was a bit rebellious, intelligent and talented. I don´t know how to interpretate the pun about Puck missing. Was it because he is one you don't care about in the island or because it was a really short time? There's nothing special to understand. He disappeared one day and they weren't sure why. If it had only been for a short time, people wouldn't have noticed or been surprised. Not sure what's confusing you here to be honest. I wonder if those entities inhabiting the trees were once old magic users who had their souls transferred to trees to prolong their "lives." Which of course, made me think of our favorite old man knight. It could be, but I also couldn't help but wonder if the magnitude of what happened to Ganishka didn't impact Skellig somehow. Maybe their spiritual trees were changed in his image. Just a thought. Well the King doesn't live in the house at the end of the episode, if that's what you mean by "literally". I think it'll take a few more episodes before we get to see him. On a side note, I'm pleased that so far the healing process for Casca seems to fit what I had predicted. 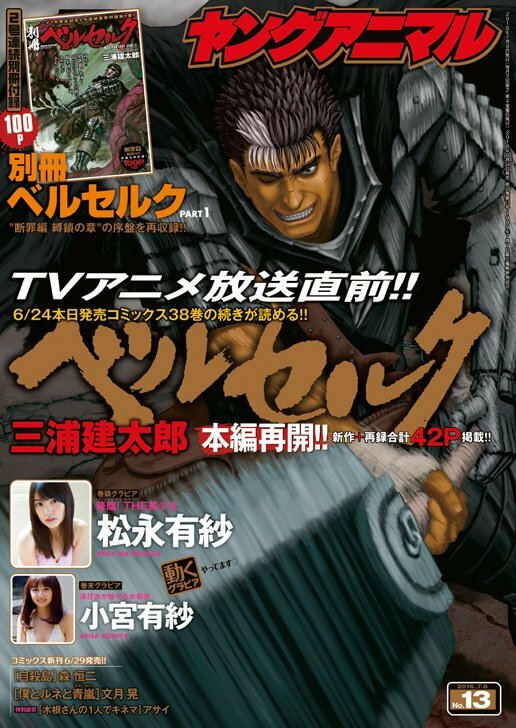 I think it's more a testament to how much trouble Guts has gone through for Casca, in case anybody had forgotten. a bit rebellious, intelligent and talented. That description fits basically half the characters ever invented. thanks for the summary Puella and Aaz! I know the episodes are taking a long time to come out, but the pace of the story itself is a bit fast. kinda wish Miura would slow it down just a bit (for a little extra world detail i guess). I felt Falconia deserved 1 or 2 more episodes. Still eager for the Elf king though! Sure, but that was all I could think of since I don't think that Morda has Jane's artistic ability or other, er, problems. I just agree that Modra looks a bit like Krysten Ritter , but Jane is the only character she's played that I'm familiar with. So, I tend to think of Jane every time I see Morda even thought they're very different in a lot of ways. Then again, bad judgement could be an issue with Morda too. I know the episodes are taking a long time to come out, but the pace of the story itself is a bit fast. kinda wish Miura would slow it down just a bit (for a little extra world detail i guess). I felt Falconia deserved 1 or 2 more episodes. That's always how it goes. But you should trust that Miura knows best. Secured my volume and Young Animal issue early! Quite a happy chap. What a phenomenal amount of information. The summary definitely helped! Thanks puella. Nice! 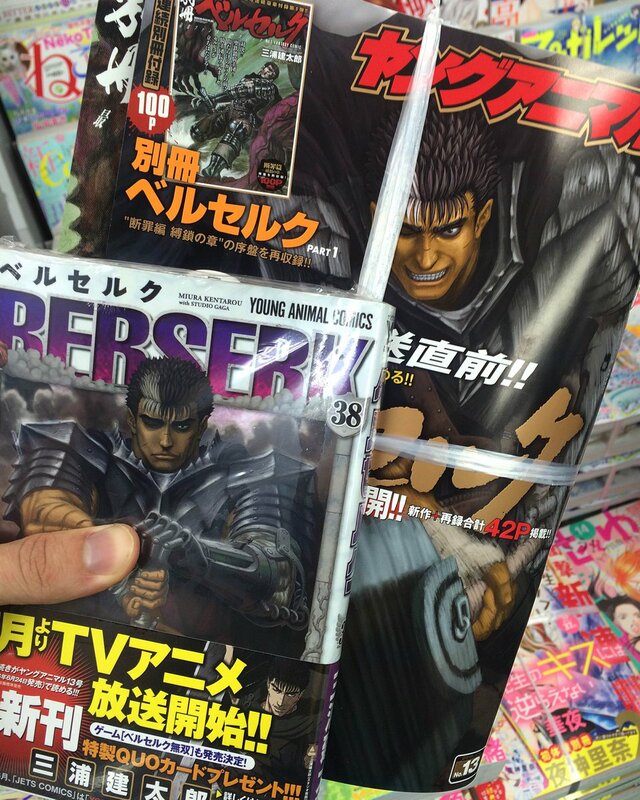 CDJapan shipped my YA issue yesterday (a Berserk cover is always a good excuse to get a physical copy ) but it'll be a couple weeks before I get it. Need to find a place where I can get volume 38 and the revamped volume 1 together though. Anway, since you've got the magazine, would you mind posting the Katakana for each character's name whenever you have the time? That'd allow me to try and work out a spelling. Thanks! クッカ = braided, black haired witch Cucha? ヨニ = young male warlock Yoni? テューネ = tall light haired witch Chuné? What a treasure chest of information we got. I love this, also thanks Puella and Aaz for the summary and all. !!! Direct scan of the Young Animal 2016 No.13 magazine cover.